Prior to the Encinitas Crack Shack opening this past February they had a media preview that I was really looking forward to. It was on my calendar and evidently I forgot to notice it until the day of the event. In one of my more bonehead culinary timing moves, I cooked up some of my killer 24-hour buttermilk soaked, triple dipped, extra crunchy with a hint of Cajun spice fried chicken the night before and had it for lunch the day of the event. So I was not necessarily craving fried chicken walking into a joint that is all about it and on top of that, I’d put my home cooked recipe up against any I’ve had in San Diego. All that aside, I was excited to check out their second location with all the hype and accolades around the first Shack that opened in Little Italy in November 2015. That spot became an instant smash and landed on all kinds of “best of” lists. Even now, the original Shack still serves serve up to 1,000 fried chicken and chicken sandwich orders on a Saturday. Crack Shack Encinitas was the second concept by Mike Rosen and chef/partner Richard Blais of Top Chef fame, who has parlayed that into full-on celebrity chef status. Randomly, I saw him pop up in the movie “Why Him?” with James Franco on a recent flight. That said, you can’t doubt the culinary chops of the chef behind the fabulous Juniper & Ivy in Little Italy. So one of the things I really like about the Crack Shack Encinitas is the open, indoor-outdoor design that features a combination of four-top tables, picnic-style tables, high-tops and a very long bar. It’s like there is a seating area for every mood with the outdoor area perfect for families with kids as there are plenty of playtime options to keep them busy. I can’t recall a time in the past six months when I’ve driven by that corner and not seen parents and kids in that patio area having a blast. It’s a far cry from the Coco’s that resided in this spot for years. I did have some traffic and parking concerns as the plaza it occupies has several businesses that I frequent including the FedEx, Gordy’s Bakery, CVS and yes, Smart & Final. It can get busy during peak hours but it’s not as bad as I anticipated. I’ve discovered the bar is a perfect place to pop in on a Sunday to catch a portion of an NFL game. I must say they are doing some mighty fine cocktails at the Shack along with the obligatory crafty beers on tap. Let’s talk about that hyped up chicken that people are so crazy about. First off, the chicken and eggs are all organic, free range and never frozen and sourced from Southern California farms. I’m thinking that in health conscious coastal Encinitas this was probably required by the city when they heard that a fried chicken joint was coming to town. I jest, of course, but it’s a quality move regardless. 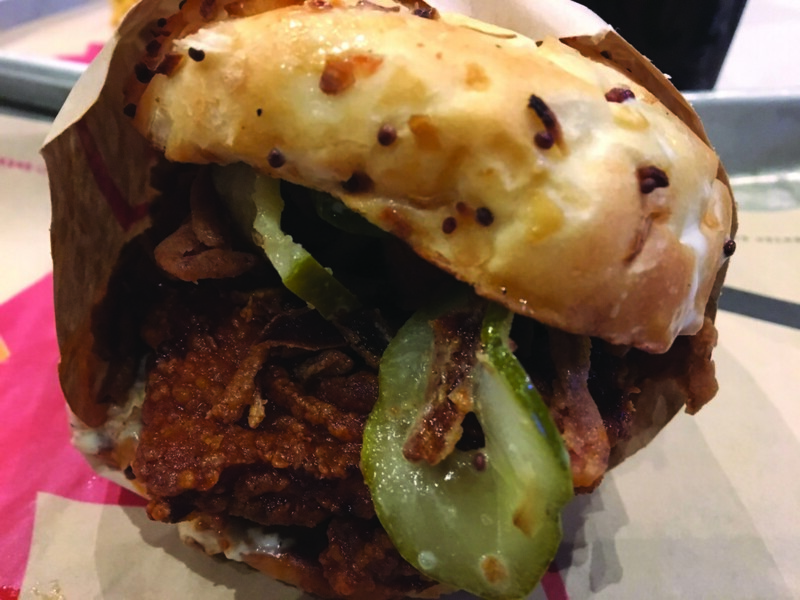 But back to my point, I found that the Firebird with spicy fried thigh, cool ranch, crispy onions and pickles on a potato roll was about as simple as they came at the Shack and well, with some Ranch dressing to dip it in it was a solid sandwich. At $11 it’s not cheap, but given the quality of the ingredients I’m not going to complain about that price. There are eight other sandwiches with clever names, stacked with eggs and bacon and fries and such and if that’s your thing I’m quite certain they will appeal. There is even a sort of fish sandwich in the mix with the Sea Senorita with seared rare tuna, pepper rub, mustard seed tartar, romaine and pickles on whole-wheat brioche. There is also straight-up fried chicken available at $15 for five pieces and $29 for 10. Not cheap, but remember, this is not KFC here folks, it’s solid fried chicken from happy local poultry. They have some very nice salads as well with the Baja Chop being my favorite. I split a sandwich and the Anti-Salad Power Bowl recently along with an order of deviled eggs and we were happy campers without being overly full. The Power Bowl has a very generous portion of smoked chicken, soft boiled egg, heritage grains, Chato’s salsa, avocado and arugula for $10. It was one of the better values on the menu as it can easily feed two. The Mini Biscuits with miso-maple butter were fun and they have a kid ‘s meal that includes either nuggets, grilled chicken or grilled cheese. Just an FYI, if you see what appears to be a long line along the outside, that’s simply where you put in your order then they give you a number. Despite being a very popular place and dong steady business, there is usually a place to sit, even it it’s at the bar. Get to the Encinitas Crack Shack at 407 Encinitas Blvd or carry out at (760) 230-2968 or visit www.crack-shack.com.